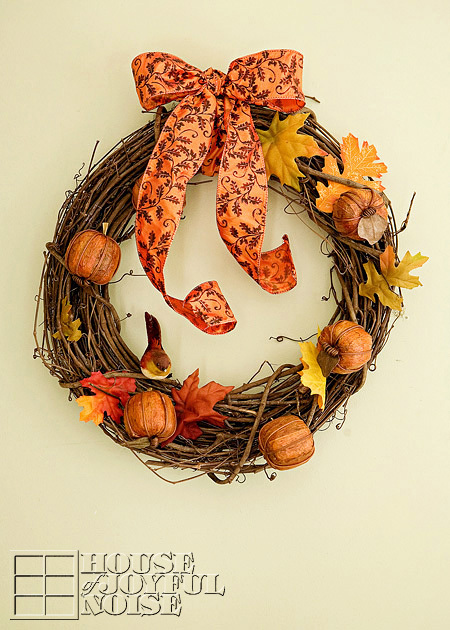 If you’d like to add a touch of crafted Autumn decor to your home, but don’t have a lot of time or energy right now, this wreath is for you! It is so very simple and quick to make. I think it’s beautiful, and has a real rustic flair that fits right in here at our homestead. 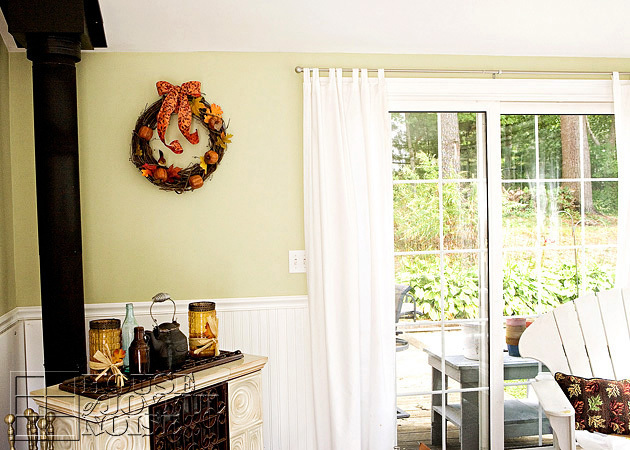 I hung our wreath in the sun room, on the wall directly in front of anyone coming in through our front door. It’s so very simple to make, you really don’t even need to be shown how. But I will tell to you how, and give you a couple of tips as well. 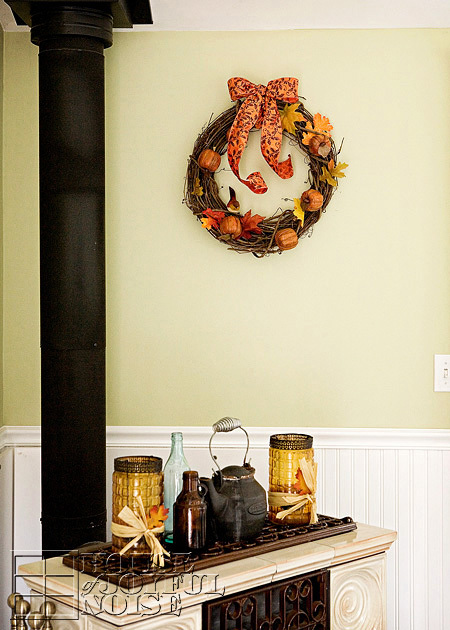 Start with a stick/branch wreath, which can be found ready-made at your local craft store. The pumpkins I also found at the craft store. They are very light in weight, made of a paper medium, and some kind of painted wire. They are finished with a shellac, and they came as a bunch in a net bag, much like potpourri comes. So you may want to look in that area. To attach them to the wreath, I used a small piece of raffia! 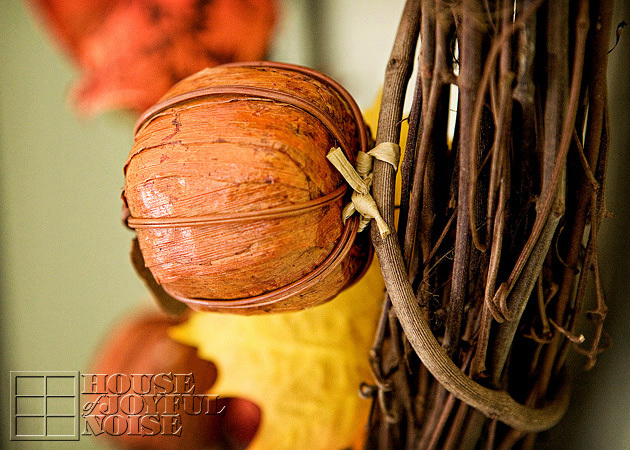 I simply slipped it under the wire on the bottom/underside of the pumpkin, and tied it onto a branch where I wanted the pumpkin placed. How easy is that? I cut any excess tails of raffia I didn’t need, but I don’t even care if it is seen, because it just adds to the simple rustic charm of the wreath, in my opinion. 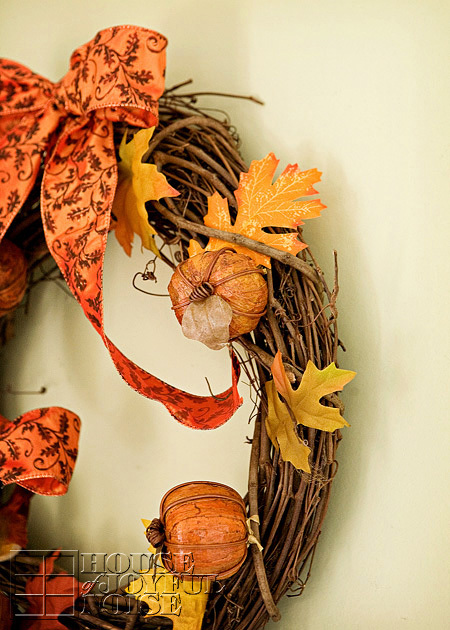 Then I added some nice looking faux fall leaves. You can simply just tuck them under the intertwining sticks of the wreath. 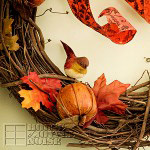 But if you want to be sure they stay, and/or plan to save the wreath to use year after year, I recommend using a dab of glue from a glue gun at the base of the leaf or stem area, and stick in between branches in an inconspicuous place. 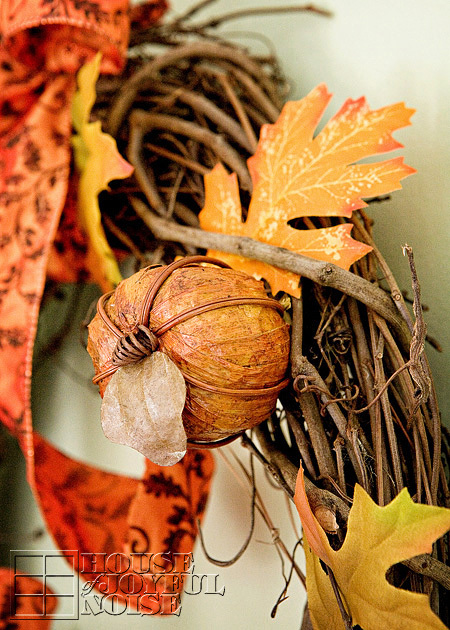 The leaves don’t need to be any more attached than that, and keeping the leaves loose gives it a more natural look. Just follow that technique with leaves and pumpkins, all the way around. The little birdie is just a clip on, and was also picked up at the craft store at some point. 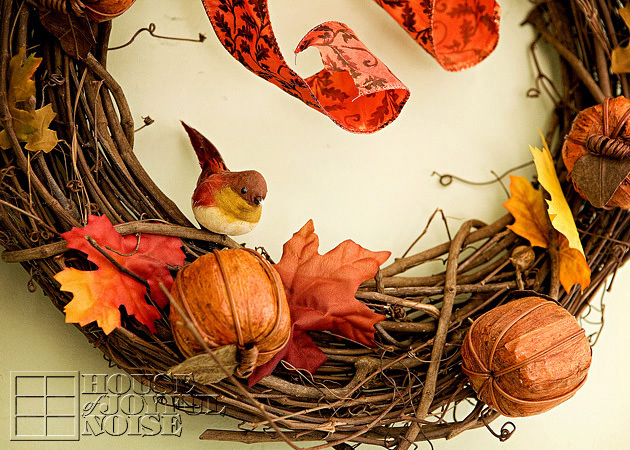 It was one we had, and it not only went perfectly with this wreath, with it’s warm tones, but added new interest. The wide ribbon is wired, which can be a little difficult to work with, when tying bows or making nice curls. But I found a trick I’ll share with you. TIP: When working with wired ribbon, use an aluminum can, cup, or any cylinder object to make nice curls for the tail of your ribbon, or uniform loops in your bows. Simply choose an appropriately sized cylinder object, relevant to the size you’d like your curls or loops, and use it to shape your ribbon. You can place the cylinder into the loops to make them nice and round where they curve around, and/or wrap the ribbon around the tails to make nice curls. It’s really as easy as that! It can literally be done in 10 minutes. 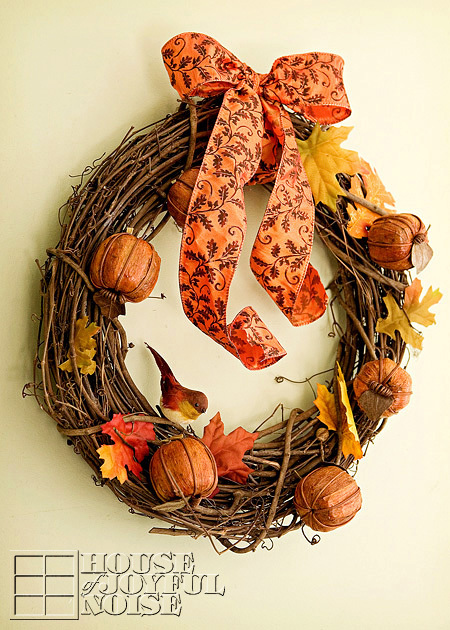 It’s not only a simple and beautiful wreath for this awesome season, but you can say you made it yourself.